Here we are committed to helping businesses effortlessly to monitor their online presence, in ways that save time and maximize productivity. As a part of this dedication, we’ve been working hard to assemble new combinations and integrations to convey a Customized RankMeOnline experience that is one of a kind and caters to advancing needs of our different group of customers and businesses. By combining Artificial Intelligence with actual customer’s perception via online reviews posted by customers and their propensity to choose your brand,RankMeOnline presents a curated dashboard which shows the user engagement when it comes to your brand on social media(Commenting), Google search results, Reviews and complaints on web, Brand popularity Geographically, Competitive analysis, Sentiment analysis, Google Ratings, Brand name mentions from all over the web like blogs, news & website etc. We build RankMeOnline in such a way that play smart with existing solutions and technology. The moment businesses are moving to the digital world, the more customers or clients are choosing brands for business on the basis of their online presence. It should be monitored frequently as a business but monitoring brand’s sound indulges huge cost of accumulation of data, interpreter’s time and efforts. RankMeOnline integrates Google and Facebook presence combined with Artificial Intelligence and delivers sentiment analysed results. No need to open multiple tabs or log into various accounts just to monitor what is going on with your brand online. This integration makes it damn easy to monitor the analysed results at one place and take necessary action or taking corrective actions. RankMeOnline is a brand monitoring tool provides your brand’s mentions on a real-time basis. The tool provides real-time alerts for a company’s keyword and allows users to monitor millions of sources in real time after signing in for start getting notifications. RankMeOnlinemention alerts tell you when your brand name is catching fire. So that you can react to the bad or good news. This platform tells you what people are saying about your brand. It takes only 2 minutes to display brand’s detailed report. RankMeOnline is not only solution to the companies to monitor its overall picture, even it’s a solution for the marketing and reputation agencies. They don’t need to go to multiple websites, scrap data and spend a half day on making progress reports on every third day for their respective clients. RankMeOnline gives the chance to check as well as get reports on your system and smartphones. All you need to do is just enter your website link(link is more specific than name), get the report online and to get a report in your system, request a detailed report and we will send it within 10 minutes on your Login email ID. Most of the people only know about CIBIL Score which decides whether you will get the loan opportunity or not on the basis of your past payment history like CIBIL score is important for loan approval likewise reputation score is important for more business generation and generating trust in Society. Nowadays business owner is trying to get reputation score for their business to tell its audience about its brand value. Our platform gives reputation score on the basis of your customer’s perception. Get a reputation score that encompasses how your customers feel about you holistically and analyze various ways you can improve that score. 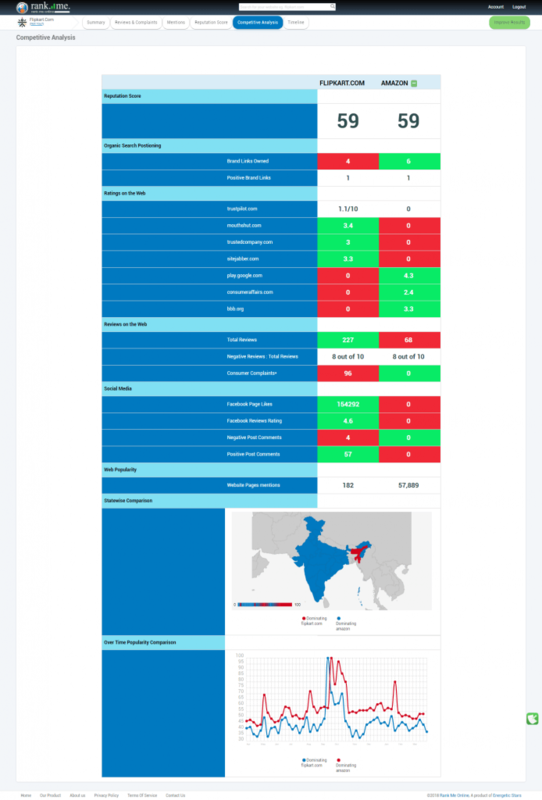 It analyses the data and displays reputation score according to how your brand is operating in a market. It gives you the idea, the things are going well and on what factors you need to improve. It suggests what things you can improve to increase your reputation score. Even investors, clients and banks check reputation score to judge brand’s reliability. Business owners hire reputation experts to check and manage its online reputation, but it takes a long time accumulate all reviews and complaints to judge which links or negative reviews are affecting your brand’s reputation, still you reach only 20-30% negative complaints butRankMeOnline made it more than easy to find out its 1 to 100 reviews at one place in no time. Our algorithm does magic and displays all the results on your Dashboard. Competitive analysis gives you the chance to compare your brand with your competitor brand in terms of each and every digital perception factor like ratings on the web,reputation score, organic search positioning , reviews on the web, web popularity, state-wise comparison which tells which brand dominate other in terms of search and awareness about the brand. It gives all the factors in comparison for improvements. It provides the basis to compare and improve at our platform, It is a feature you won’t get on google but RankMeOnline provides you this on real-time basis.